I love the holidays. The gifting, decorating, music (some of it, anyway), the baking, the parties and the sparkles – I love all of it. I read holiday-themed stories, too, both in-season and out. Some of them are good, some are terrible, and a few fall into mediocre territory. 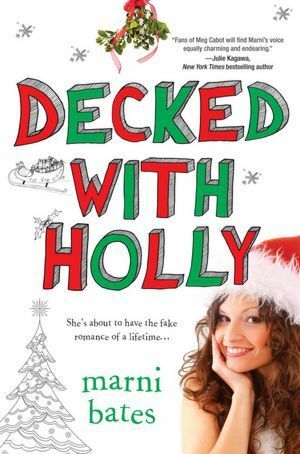 While Marni Bates’ Decked with Holly had a stellar recommendation and a happily-ever-after at Christmastime, it did not deliver that other important element I look for in contemporary YA – a plausible, enjoyable story. Smartly blending of-the-moment pop culture references and timeless themes, Bates follows her YA debut, Awkward, with a hilarious, over-the-top adventure about a teen girl who becomes the fake girlfriend of a cute rock star. Heroine Holly is that non-endangered species, the YA cliché (she’s *ahem* an orphan). She also has evil stepsisters, a doting but largely absent grandfather, low self-esteem, naïveté, and she is pulled into crazy situations by her best friend Jen. Did I mention that she’s poor? And her cousins call her Orphan Annie. I could go on, really. Dominic Wyatt, her supposed foil, is a rock star a la Justin Bieber or One Direction, and he just wants a break. What is absolutely amazing (read: sarcasm) is that he has no entourage and a pretty non-existent family as well, which makes convenient and possible his availability on the same cruise as poor girl Holly. Throw in some seasickness, some rabid fans and a large contingent of paparazzi (again, how?! ), and you’ve got the makings of YA as wish fulfillment, sans charm or cohesion. As I alluded to above, what bothered me most about the story was its deadly combo of cliché and implausibility. I can appreciate a light, cute story with famous characters (see: Epic Fail, Jenna & Jonah’s Fauxmance). However, when the plot has gaping holes, the characters seem to be made of cardboard, and there are no real surprises or obstacles to overcome or character development to be had, it’s time to reevaluate. What did I like, then? Well, I like Christmas. I’ve never considered going on a ‘real’ vacation over a holiday (except for that one time when I was in Spain for a semester… does that count? ), but the setting of Christmas on a cruise ship was interesting. I also thought that the characters had decent chemistry, even if their dialogue and interactions wouldn’t win any awards. And that is pretty much it. Recommended for: those with an incurable desire for fluffy Christmas romances, and fans of Rachel Hawthorne’s Snowed In or Love on the Lifts. Yah I'm thinking this one isn't for me either. Thanks for the cautionary notes on all the cliches. Yeah, doesn't dound like one I want to read, but I do kinda like the idea of a Christmas cruise. yeah! another negative review of this one! I always feel guilty writing negative reviews when everyone else is gushing about a book... but this one wasn't very good!